Book collecting, at least in my case, is varied in direction, focus, obsession, level of scholarship and result. A defining element of my character is my love of research, pure and simple. Unfortunately, book collecting is one area where the infinity of pathways that arise when researching ensures that I will never know everything I want or should know. When systematic analysis and research fails, you just have to sometimes rely on pure, simple, dumb luck. In May of 2009, after a 25 year run, I left my last publishing gig to pursue something else with my life and mind. My initial intent was to figure out a way to carve out a space for myself in the general area of rare book collecting, turning a passion into a profession as the saying goes. I established some general parameters and started developing a plan. Where else to start but choosing a name for my new business. I have always been a reader and book buyer but it only became more a disorder of mind when I began a continuing interest in the books and writing of Henry Miller. I was introduced to Miller via The Tropic Of Cancer and the Tropic of Capricorn (a subject of future posts). After reading both, I started to delve more deeply into Miller's oeuvre and next read The Books In My Life (New Directions, New York, 1952). This is a book that changed my life or at least acted as the gateway drug for my enduring book addiction. Miller's memoir of the books in his life reinforced my opinion that what we read, along with what else we experience, determines who we are as a truly unique person. It also provided me a fresh list of books I must read and eventually acquire for my private library. 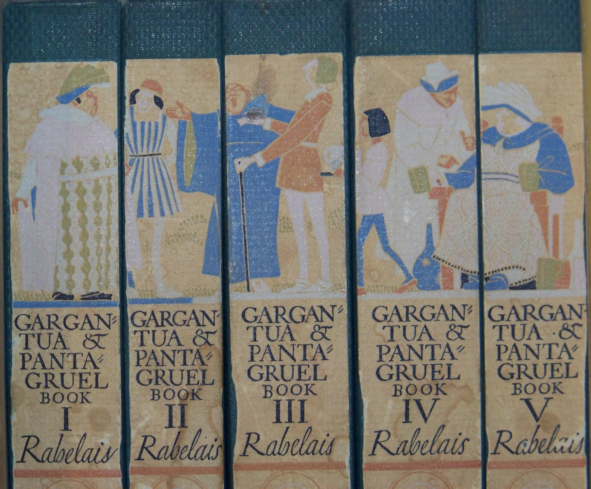 The first book on my new reading list was Rabelais, Gargantua and Pantagruel . 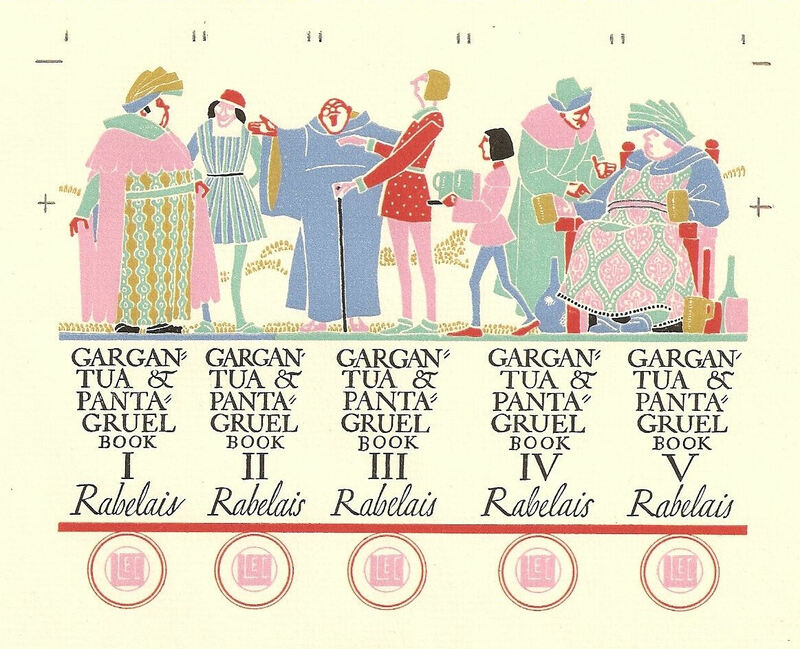 How Rabelais had never been on my radar after years of first rate liberal arts education remains a grand mystery. Years later all I have to do is think "Rabelais" and I start to laugh at myself and the world, "Live Happy" is a great life motto! If I was going to build a future around books, book collecting and private libraries, The Books In My Life would be the name for my business and Rabelais would be the little voice in my head reminding me to have fun with it. Not a great image but it had the special elements I wanted. I was ready to move along and ordered business cards. A few months later, armed with business cards and a few ideas, I prepared to attend the 33rd Annual Boston International Antiquarian (ABAA) Book Fair, a very important event for me and my evolving ideas concerning my future. I had not attended the Boston Fair for perhaps 10 years because of conflicts with various scholarly conferences I attended for my publishing work. With the beginnings of an idea, a passion for book collecting and a willingness to start somewhere, my wife, Anne and I, headed into Boston where I expected to basically "work the floor" at the show, introduce myself to the esteemed book dealers, and start to test my ideas of how to join the battle. My one concrete goal was to meet certain dealers who were active in book blogging and the still newish, social media world of Twitter and Facebook. Number 1on that list was Lux Mentis of Portland, Maine, to meet Ian Kahn the proprietor and active rare book blogger. After visiting the first row of the exhibit hall, Anne and I turned corner and found ourselves at the Lux Mentis booth. Anne, without knowing my goals, started looking around without pressure, while I was trying to survey the books, determine how I would start a conversation with Mr. Kahn, and feeling a wee bit overwhelmed by how unprepared I really was to just jump into this madness. Within a few minutes, Anne exclaimed, "Oh, my God, Tom look at this!" 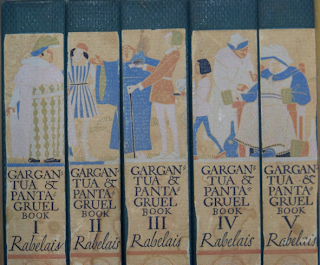 And what was I too see but the image of my treasured Rabelais spine. 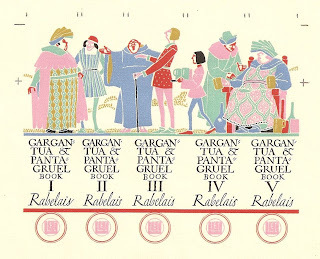 Yes, the actual printer's proof of the spine illustration, prepared for the Limited Edition Club edition of Gargantua and Pantagruel hanging on the wall of the booth, behind glass in a simple plastic frame, I believe the asking price was $525. While my heart began to race with excitement, Anne's excitement caught the attention of Ian Kahn and he quickly pounced, ready to make a sale. The show had just opened, it was preview night, I don't ever like to tip my hand when negotiating for a book purchase (or anything else for that matter) and there I find myself, sharing in Anne's excitement yet horrified that Mr. Kahn was closing us on a sale. I initially tried to calm the situation and establish some type of control. Not that I didn't want the image, I was just not ready to make a snap decision. I don't do snap decisions unless they come from the natural instinct of flight or fight. Anne kept encouraging me to buy, Ian kept encouraging Anne, I kept stuttering, trying to gain control. Finally, I was able to start a proper introduction and show Ian my business card with that iconic image. At that point he realized that this sale would be one of his easiest at the show. We chatted, he gave me some quick insight into the business and before long, we gave him a check for the image. A one of a kind piece of book history is now safely stored in the private library of Anne and Tom Stone and the Dwiggins designed illustration sets the tone for my blog, consulting practice and dream to successfully grow, The Books In My Life. Across the thresholds of your virtuous homes. For Laughter is the essence of mankind.